Powers: He has cybernetic body parts which grant him superhuman strength, speed, endurance, and durability. Victor can also interface with other forms of technology such as computers. Over time he has been further enhanced to include a self repairing system which caters to both his cybernetics and his biological components. Born to Elinore and Silas Stone, two scientists heavily involved in enhancing the human intellect, Victor became the subject in these experiments. They were successful and Victor as a result gained genius level intellect. Wanting an identity for himself however he rebelled against their scientific endeavors by engaging in both sports and gang violence both of which they disproved of. His love of sports and how he excelled at it gave him hopes of one day entering the Olympic Games [Teen Titans/Outsider Secret Files #1, 2003]. On the day which changed his life forever he visited his parents at the world-famous S.T.A.R Labs. While here he witnessed his parents experiment with Dimensional travel technology going terribly wrong. It unleashes a force that kills his mother and mutilated most of his body almost killing him. It was only intervention from his father which ultimately saved him [Teen Titans/Outsider Secret Files #1, 2003]. Victor’s father rushed his son to his lab and desperately grafted cybernetic parts to his organs and computerized synthetic nerve bases to his spine. Once Victor was stable, his father followed through by replacing his limbs and part of his face with experimental molybdenum steel. Victor Stone became a true Cyborg [Teen Titans/Outsider Secret Files #1, 2003]. Upon regaining consciousness he is horrified at his new physical appearance his initial reacting is that he wished for death though he eventually adjusts and learns to use his enhancements. After being released from hospital after much physical therapy he finds his return to society troubled as he can’t fit in, gets booted from school, sports and is rejected by his girlfriend because of his new mostly metallic body. When he thwarts the plans of his former gang friends attack on the U.N he finds his calling as a superhero. He then joined the Teen Titans at the request of Raven. Out of gratefulness for the home that his son had found, his father built the “Titan’s Tower”. Silas would later die eight months later of radiation poisoning. During his sickness Victor reconciled with his father and stayed at his bed side until he died. One of Victor’s most notable friendships while a Titan was with Beast Boy/Garfield Logan. He also had mutual attraction with Sarah Simms who worked with children who had prosthetics, though nothing ever became of their relationship. Around this time they also tried to upgrade his cybernetic systems and even give him artificial skin which his body rejected. He also found acceptance and grand adventures while also befriending Bumblebee and Vox. S.T.A.R Labs then entered his life along with Dr. Sarah Charles. The two developed feelings for each other and started a romance. His grandparents Tucker and Maude Stone re-entered his life at this time. They managed to reconcile over time as they only had each other left in the world [TALES OF TEEN TITANS #46, 1984]. When Dr. Sarah Charles was transferred to the western branch of S.T.A.R Labs it put a strain on their relationship [NEW TEEN TITANS #45,1988]. Victor found himself captured by the Wildebeast Society and before he could be rescued he was launched via rocket to Russia. Severely injured during the crash landing he was found by his teammates and their ally Red Star who took them to the Science Society who tried to fix Victor’s ravaged Mind and Body. 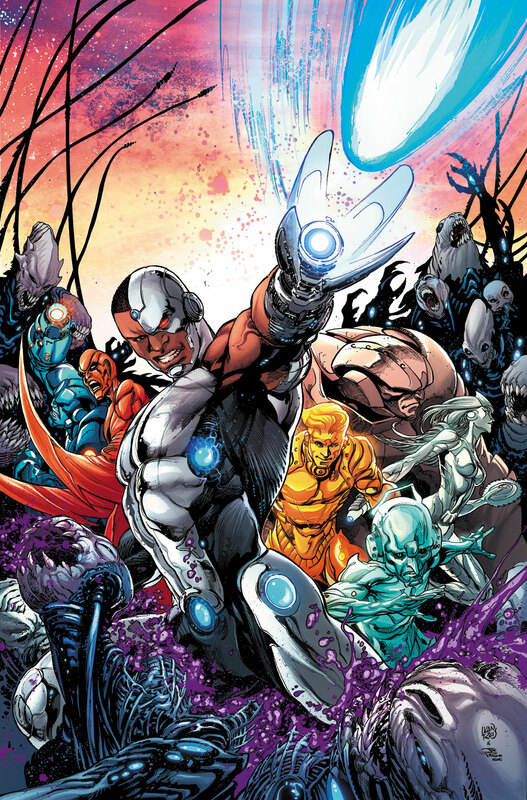 The Russian government took a vested interest in the restoration of Cyborg as they saw him as a living weapon. Victor found himself used to attack his teammates before being freed and sent back to America. The Titans defeated the Wildebeast society but were unable to restore Victor [NEW TITANS #77,1991]. Encountering the Alien race known as the Technis Victor’s humanity was restored. When the race was dying and in need of a soul to survive, Victor merged with Technis to save them. As thanks he was given a new name and a new body; Cyberion was born. After Tamaran was destroyed during a conflict Beast Boy opted to travel space with his friend. Beast boy would later leave when he realized Cyberion was more machine collective than human being. He also was reunited with Sarah Charles while in this new form. Taken over by the Technis’ desire to restore their planet he returned to Earth with the purpose of turning the moon into a new Techno-Organic world. 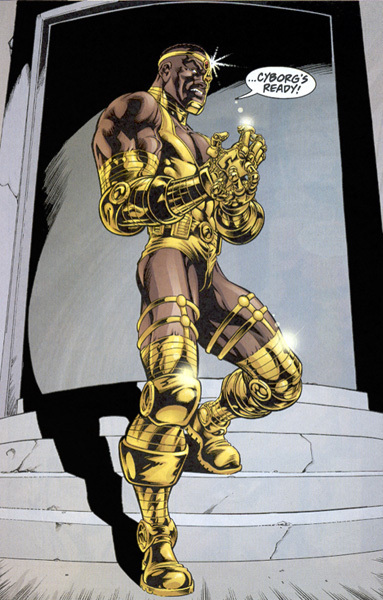 In this bid he fought both the Titans and the Justice League before his soul was restored and given a new golden body. The original Titans then decided to re-form the team and he accepted. In this new tea he was watched by Nightwing who was worried he would relapse into his Technis personality. Over the course of these adventures Nightwing cloned his a new body harvested from the cells the Russians had taken while they worked on him. He could now move between his golden form, the Omegadrome and his fully human body. With his humanity restored he left the team. Aiding the Flash during the “Our Worlds at War” crisis he used his shape shifting omegadrome powers to mimic his original cybernetic appearance. He then stayed in Keystone city, home of the Flash and restarted his superhero career. His body reverted to its original form after his mind linked with a computerized Mad Thinker. Drawn into conflict with the Indigo who had attacked both the Titans and Young Justice. The seeming death of Troia and Omen, Nightwing disbanded the team. 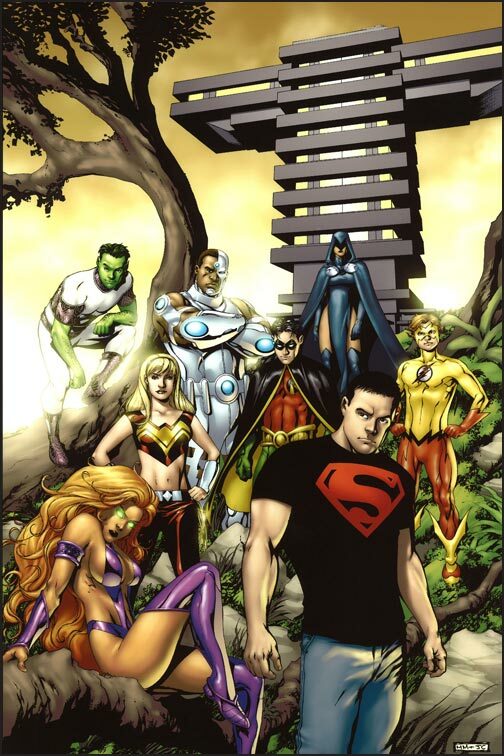 While recovering from his injuries he upgraded his system and became mentor to a new crop of Teen Titans consisting of Wonder Girl, Robin, Impulse and Superboy. He saved the lives of the Titans when Dr. Light attacked. he then traveled into outer space during Infinite Crisis. This left him severely damaged and it took months for him to be fully rebuilt at Titans Tower. He is then given co-leader status next to Robin. Batman and Superman later suggest eh would make a good member of the Justice League. He then forms the ill fated Titans East which leaves him again severely wounded. He is placed in a hover chair while he rebuilds and becomes friends with new member Static. Victor fights off a host of newly Cyborg beings created in his likeness. After Blackest Night he joins a new Justice League and saves the titans from the villain Holocaust. Victor later ships Static off to Cadmus when he is powerless. In the reboot Victor is a high School football star highly sought after by just about every college in the United States. Despite his fame however his very busy scientist father, Silas has never been to one of his games. They have a strained relationship [Justice League (2011) #1]. Visiting his father at Star Labs they get into an argument while another scientist works on a “mother box”. As things get heated between the two the “Mother Box” explodes with energy killing the scientist and severely burning Victor all over his body [Justice League (2011) #2]. His father desperate to save his son carries him into “the red room” which houses alien and advanced technology from all across the globe. Despite Victor’s protest his father makes him into a cybernetic being. With the Mother Box energies within him he gains access to the vast repository of information in the “New Gods” library allowing him to uncover Darkseid’s true plans [Justice League (2011) #3]. Upon seeing what had been done to him he panics and flees. He joins with Batman, Wonder woman, Aquaman and Superman in battling the minions of Apokalips and he alone manages to save the day by using a boomtube. With his transformation his football career was now over and he spent more time with his father who was more fascinated with his transformation than reconciling their differences. On a mission to the valley of souls he learns that as a Cyborg he walks the line between life and death. During the “Throne of Atlantis” he refuses an upgrade that would allow him to operate underwater by sacrificing his remaining Lung. To Victor this would have meant further sacrifice of his humanity [Justice League (2011) #15]. He is forced to accept the upgrade to save his teammates when they are captured [Justice League (2011) #16]. During “Trinity War” it is Victor who alerts the team about Shazam arriving in Khandaq allowing Batman to form a team to intercept him [Justice League (2011) #22]. When the Crime Syndicate of America show up his armor is peeled away and joins with a sentient Virus now calling itself Grid [Justice League (2011) #23]. Taken in by his father he is given new cybernetic parts he requested in hopes of ending the “Forever evil” siege of Earth [Justice League (2011) #27].